Finding good monologues can be tough. You’d like to try something different, something new, but where do you start? Many teachers, students and theatre makers across the country already rely on AustralianPlays.org as their go-to source of quality Australian playwriting, and now we’re ready to lift the lid on our latest project that will take the leg work out of your monologue search. Our new database of hand-selected monologues offers a huge range of searchable options that will help you track down the perfect piece for auditions and assessments. You’ll find information on gender, genre, age and length, along with a short sample that provides a nice sense of what the piece has to offer. Visitors with an AustralianPlays.org subscription also have the opportunity to preview the full script online. shares some valuable insights after cataloguing more than 600 plays. One of the requests we receive most frequently, from actors, students and teachers alike, is the ability to search for monologues within plays. It’s not hard to understand why - monologues are so integral to the performer’s craft, from student examinations and tertiary auditions, to the pursuit of employment on the professional stage. 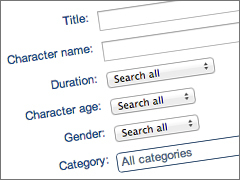 When you visit our Power Search page, you’ll find the existing play search features are now complemented by dedicated search criteria for monologues, which allow you to filter by age, genre, gender and length. Simply select an option from the search results and you’ll find information about the available monologues embedded within the information we provide about the play. Users with a subscription can also open up a preview copy of the text, read the monologue in full and understand it within the context of the text as a whole. Our current offering of 926 monologues from 530 plays will continue to grow as we fill gaps in the back-catalogue and process new plays as they become available. You may also notice that not every monologue within a given play is listed – in most cases we’ve included information about one or two pieces, as a starting point, so it’s definitely worth exploring the text further with your subscription. There’s no algorithm or predefined formula we can draw on to identify a good monologue, it requires experience, insight and a lot of patience. With more than 1700 plays to sort through, the process of hand selecting and cataloguing monologues began almost two years ago, under the watchful eye of director and producer Michael McLaughlin, assisted by writer and performer Fiona Stewart and our Literary Manager, Tom Healey. Before you head over to our handy search page, take a look at our selection of highlights that caught the eye of Michael, our resident monologue expert, which give a great overview of what you can expect to find as you search through our growing catalogue. Monologue title image: 'In The Spotlight' by Lee Carson, photographer.